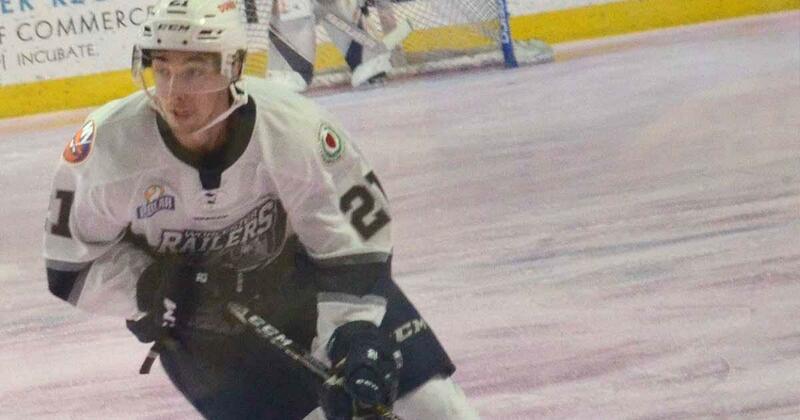 WORCESTER — The Worcester Railers came back for the first time all season from a two-goal deficit in the third period, by converting on three-power plays within a nine-minute span to defeat the Greenvile Swamp Rabbits 3-2 on Friday night. Worcester moves to (21-19-3) with 48 points in the North Division (ECHL) and are 2 points from the final divisional playoff spot. The Railers currently sit in fifth place, as they host a Wheeling squad on Saturday and a first-place Cincinnati team at home on Sunday. The Railers however, didn’t start the game with any sense of urgency, as they were consistently beaten in the corners, as well as turned over the puck in the offensive end, allowing Greenville to get out in transition through the neutral zone. The Swamp Rabbits got on the board with 3:06 left in the first period, after a sloppy no-look pass turned into a Greenville 3-on-1 rush on the other end, with Luke Ripley taking a pass across the blue line and launching a rocket off the post and past Worcester goalie Mitch Gillam (25 saves). Exactly three minutes into the second period, Greenville got on the board again, as Worcester lost a battle for the puck in the corner that lead to Adam Larkin blasting a shot from the blue line. Dylan Vander Esch who was parked in the slot, knocked down the puck between Gillam’s pads for a 2-0 Swamp Rabbit advantage. Worcester began to fight back at that point — literally. Railer’s Yanick Turcotte began to fight for position in front of the Greenville net, earning a misconduct minor, while captain Mike Cornell (Franklin, Mass.) went toe-toe with Greenville’s Brendan Harms, penalized for both roughing and fighting. The Railers garnered the momentum following the Cornell altercation, as Worcester killed off both penalties. “Obviously, our [penalty killing] is good,” Russell said. The Railers penalty kills ranks among the highest in the ECHL at 84% (130 kills out of 154). Worcester’s power play has been a different story, as the Railers are toward the bottom in the league in converting power play opportunities at less than 15% (20 goals in 158 chances). With just over 15 minutes left in the third period, after a delay of game penalty on Greenville, Worcester’s Ryan Hitchcock blasted a shot from outside the left circle, that caught inside Greenville’s goalie Chris Nell (25 saves) left pad to put the Railers on the board at 2-1. Worcester’s Ivan Kosorenkov and David Quenneville got credit with the assists on Hitchcock’s 7th goal on the season. Greenville got caught with another delay of game penalty, that Worcester capitalized on, as Tyler Barnes cleaned up a rebound off Nell’s right pad and took the puck top shelf for the game-tying goal with just under 12 minutes left in the third. Barnes wasn’t done there, as he added his second power-play goal of the game and 18th on the season with a deflection in the slot off a Kosorenkov shot. The game-winner at 6:17 left in the game, gave Worcester the 3-2 victory. After the Railers homestand this weekend, they embark on a seven-game road trip, after just returning home from a four-game road trip (1-3) over the past 12 days. Worcester currently trails both the Brampton Beast and Reading Royals who have a total of 50 points each in the North Division. A loss to either last place teams, Greenville or Wheeling this weekend, would put Worcester in a tough predicament before their next long road trip. Tim Davis is a lifelong Massachusetts resident and Westfield State graduate who has served as the sports editor at the Berkshire Record and has freelanced for MassIive, The Wellesley Townsman, and several local Greater Boston publications as well as having worked at The Register-Star in New York as a sports reporter. Tim is also an avid sports photographer and yoga practitioner.